You can now communicate more easily and effectively with other members of your firm by creating tasks and assigning them to the person responsible for completing it. Users can then apply different filters to see what tasks were assigned by or to them so that they can quickly see what still needs to be done, right from their home screen. 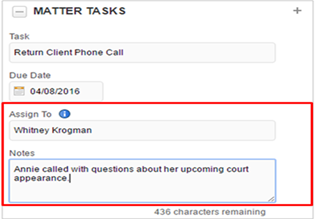 Tasks can be created from either the homepage or the matter profile page. To add a new task, click on in the top right corner of the task widget. 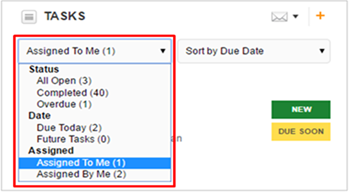 When creating a task, you will now see the additional fields to assign the task to another member of the matter team and to add a note for the other user. From the home screen, you can apply different filters to your task list, including status, date and assigned status. NEW: Only the assigned user will see this. Once the user clicks in to view the task, this badge will go away. 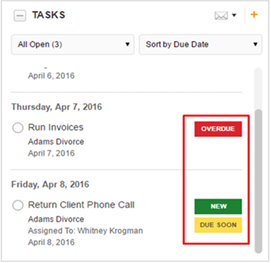 Start using the ability to assign a task to easily collaborate with other members of your firm!